A large sphinx sets across the grass circle from the Gothic chapel in the Mount Auburn Cemetery at Cambridge, Massachusetts. The statue, sculpted by Martin Milmore, is a massive eight feet tall and fifteen feet long. BY THE BLOOD OF FALLEN HEROES. Bigelow’s sphinx to commemorate the Civil War eschewed the conventions of the day regarding public monuments in the North and the South. 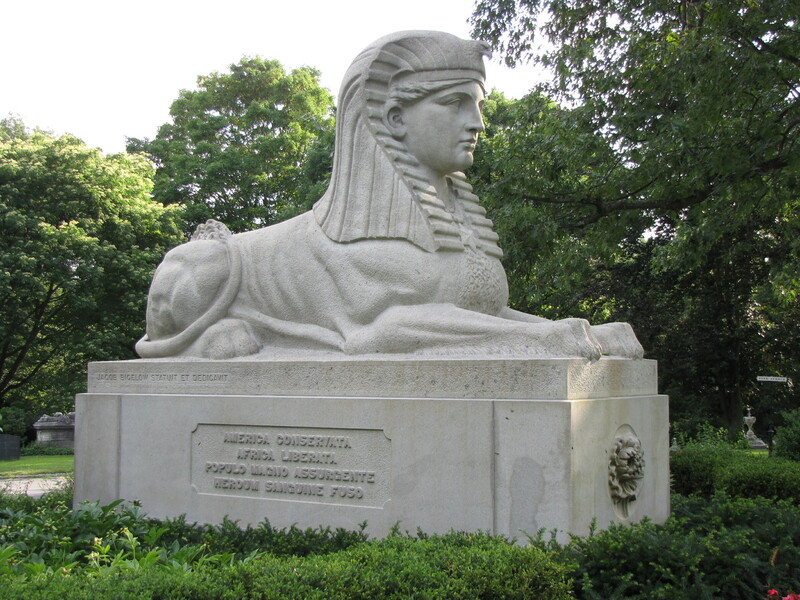 While the enigmatic sphinx is well within the Egyptian Revival movement that was popular during the 19th Century, it certainly was outside what most communities built as Civil War memorials. Most communities erected memorials of statues of Union or Confederate volunteers and bas-reliefs of battles. The sphinx represented a break from the traditional. While monumental in scale, as was the Lion of Lucerne, the sphinx does not extoll martial valor, courage, or strength. The face of the sphinx was an allegorical representation of Freedom, Liberty, or Hope. The message of the sphinx itself was that while it was looked upon as a figure of antiquity, was now a figure looking forward—a new nation breaking the bonds of the past and rising from the bloodshed to a new greatness. Unfortunately, for Bigelow, the meaning of the statue was almost immediately misunderstood, and now his monument is more of a curiosity today than what he had intended. 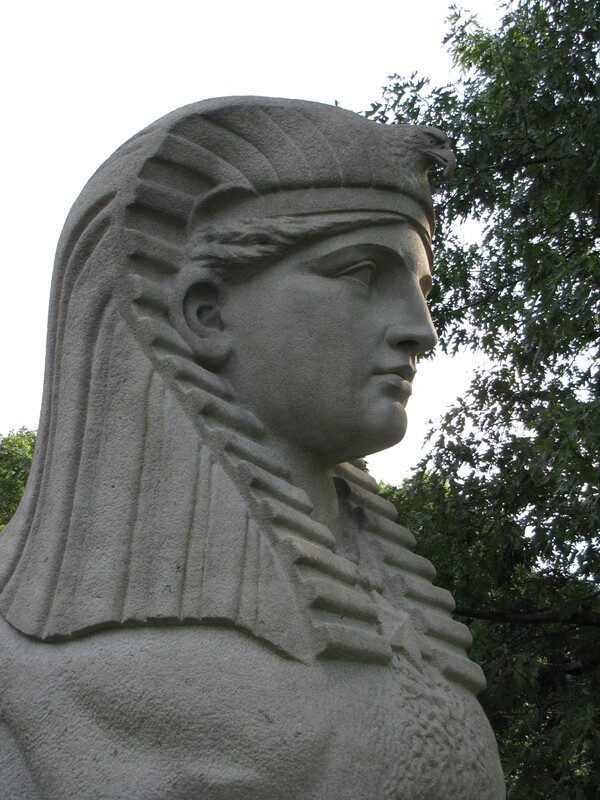 For a more in-depth read about the Bigelow sphinx read “The Americanized Sphinx” written by Dr. Joy M. Giguere, Assistant Professor of History at Ivy Tech Community College at Fort Wayne, Indiana and the Indiana State Chairperson for the Association of Gravestone Studies. It certainly is mysterious. I’ve always wondered how the sphinx related to Mount Auburn’s Egyptian gate — and the Egyptian gate at the Granary Burying Ground.